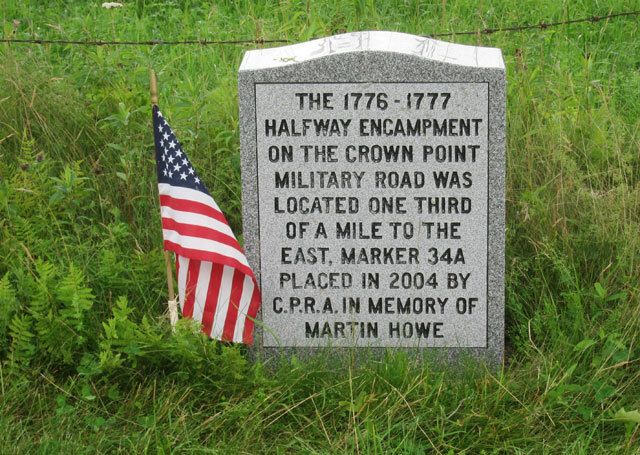 The short newspaper article spoke to me immediately for a talk “…about the two sections of the Crown Point Military Road that touched the town, and the layout of the original turnpike and shunpike.” Meeting place, Belmont Village (population 245) – one of the four villages in Mount Holly, which you fly through on VT 103, and totally miss. I had to go, even though friends asked me to join them at the Weston Playhouse for West Side Story at the same time. 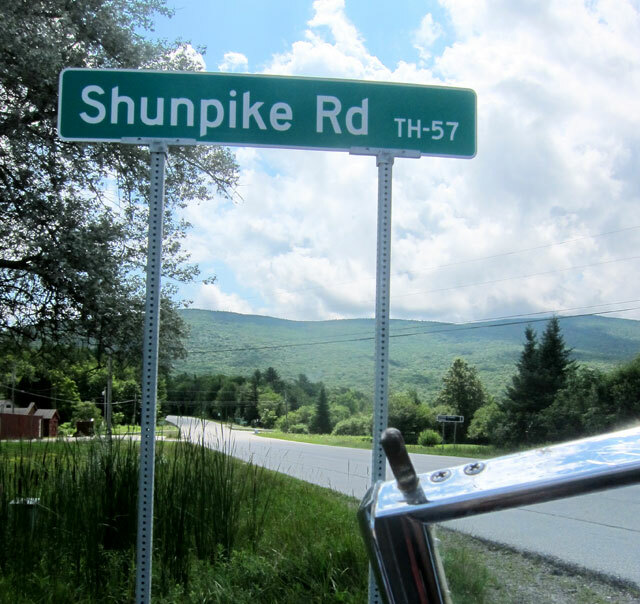 When BLACK BEAUTY and I went to the Vermont Marble Museum a few weeks ago we saw a couple signs on Route 103 saying Shunpike Road, and I was surprisingly too focused to not stop and “shunpike” – I knew I would be back. About 15 minutes from Ludlow (think Okemo) I turned left on Healdville Road (another Mount Holly village), but first stopped for BLUE BELLE’s portrait for the day. A classic hill town, as the road began to climb down you enter the village. Here are a few images from the “center of town” and you can click on any for larger size. The afternoon tour was lead by Dennis Devereux, director of the local historical society. Dennis can trace his family to Greene Dawley, born in 1783, and claimed as the first white male born in Jackson’s Gore (the original name of Mount Holly which was previously called Mechanicsville – and you need to learn what a Gore is). 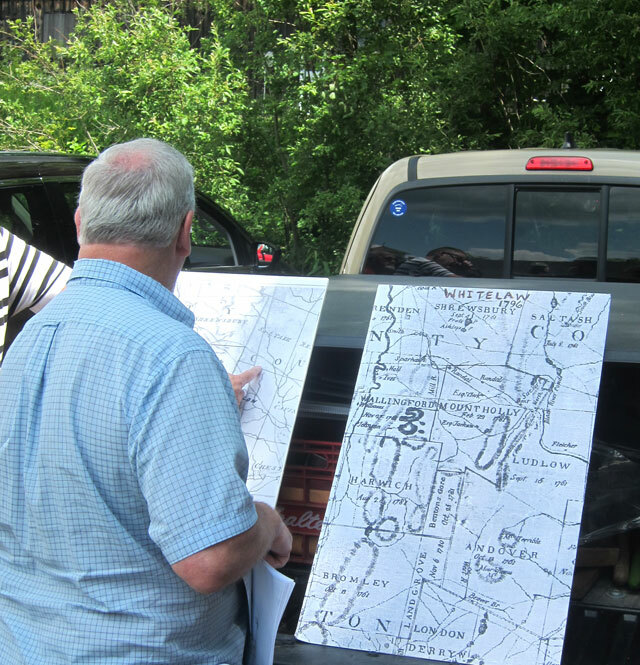 He started the tour (14 of us in a small bus, followed by 4 cars) showing the spots we would visit on these early maps. Outlined was the original 1759 Crown Point Road, the 1776 rerouting of that road, the original Turnpike and its tolls, and the sections of the Shunpike. The current Route 103 was laid out in the 1920s, but sections improved (particularly the hill up from Route 100) in the 1960s. If you travel with the right person (Dennis is the one) you discover history you would never otherwise see or hear about. 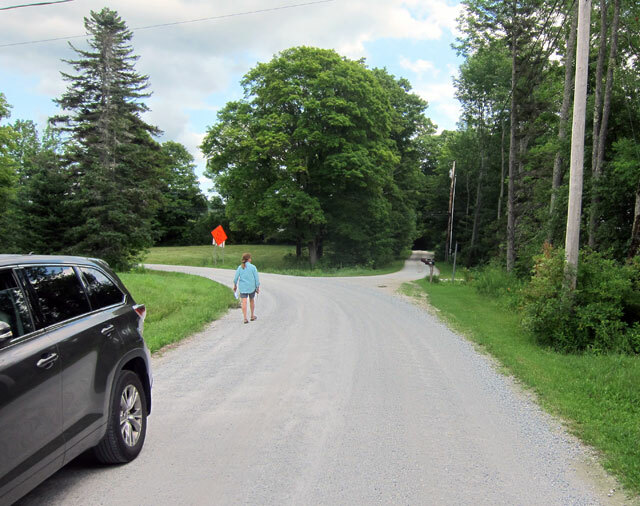 Below (off Route 103) is this section of the old Turnpike coming in on the right of the picture below to what is now Summit Road. 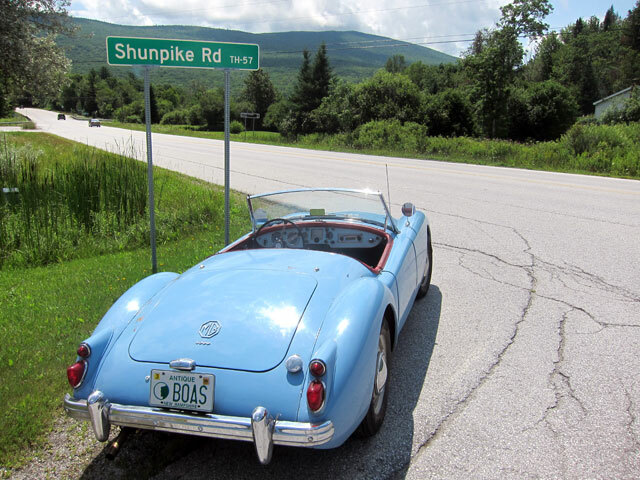 The Green Mountain Railroad today essentially follows Route 103 from Ludlow to Rutland, and Dennis pointed out locations of three, sadly now gone, railroad stations. Summit Road is so named since it is the highest point of the railroad line, completed in 1849, from Boston to Burlington. Ironically, this highest point, is also the lowest point in elevation that the railroad found to cross the Green Mountains (hope I remembered that correctly, Dennis). Dennis pointed out an excavated area with the tracks passing through. 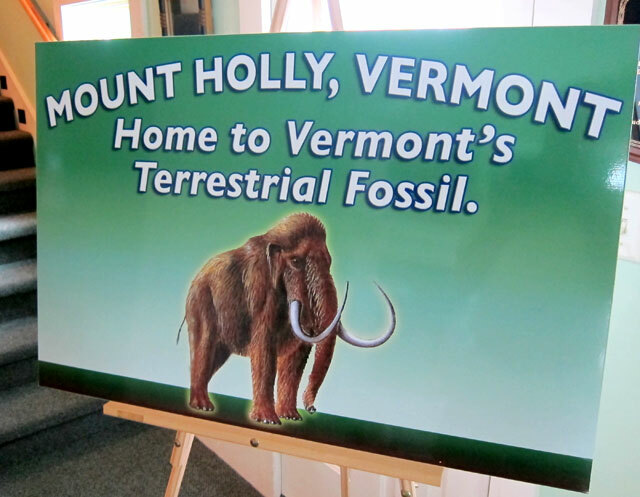 “It was swampy, so they dug down 11 feet to bedrock to lay the tracks,” he explained. 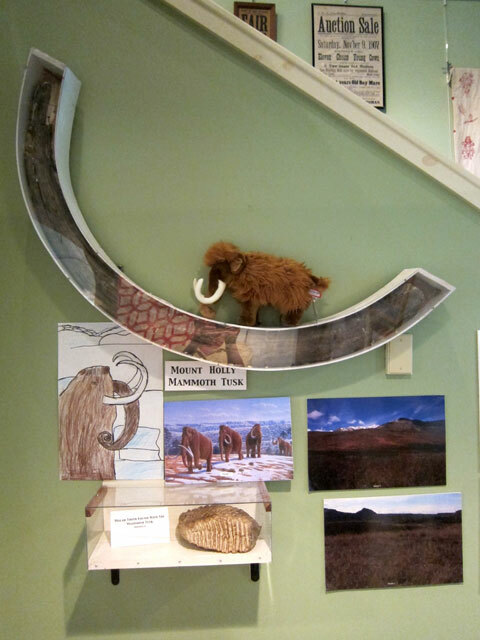 But in so doing, the construction crew discovered the tusk and tooth of a woolly mammoth (more later, and check this link now). As I have written about, the first train from Boston to Bellows Falls and Walpole arrived on January 1, 1849. I really hadn’t thought of what happened next, but, of course, several sections of track were being constructed at once. On December 18, 1849 at this highpoint, the Summit, with the tracks now connected, trains with dignitaries from both Boston and Burlington met to drive the last spike. “Water from Lake Champlain and Boston Harbor was mingled in front of the cowcatchers, and all celebrated with rum and local hard cider.” Think, Erie Canal, “Wedding of the Waters.” More history in the middle of nowhere that I needed to share. This bucolic spot was once a lake and industrial area until a 19th century freshet wiped out the dam. If you check the Mount Holly website you will be overwhelmed with everything going on in the little village. Even if you go and get a sandwich at the Belmont General Store and eat on the Common (as I did) you will enjoy yourself. 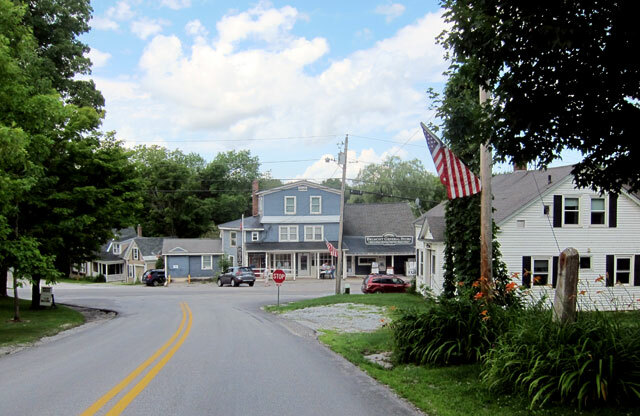 To help save the General Store from closing – a young couple just leased it for two year – I will visit again and vote with my dollars to help them stay open. And, just as I was leaving, a couple of kids were finishing up their production of A MIDSUMMER’S NIGHT DREAM on the Common. 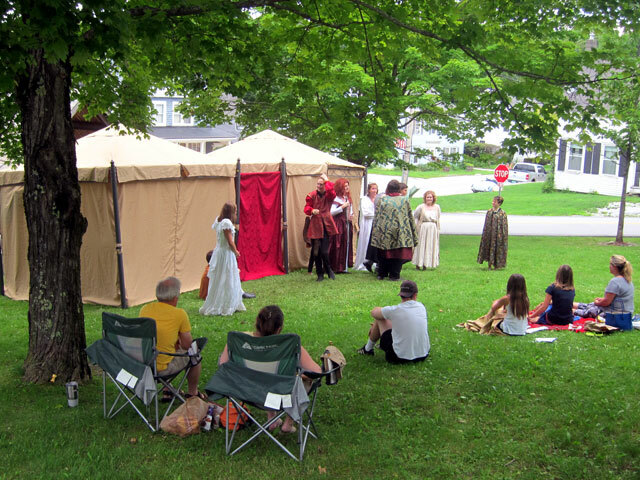 1 – Visit the Mount Holly website – and see what is happening, and then go visit. 3 – Make a loop on your visit – you can enter Belmont from Route 103, or Route 155 from Weston – many places to explore. 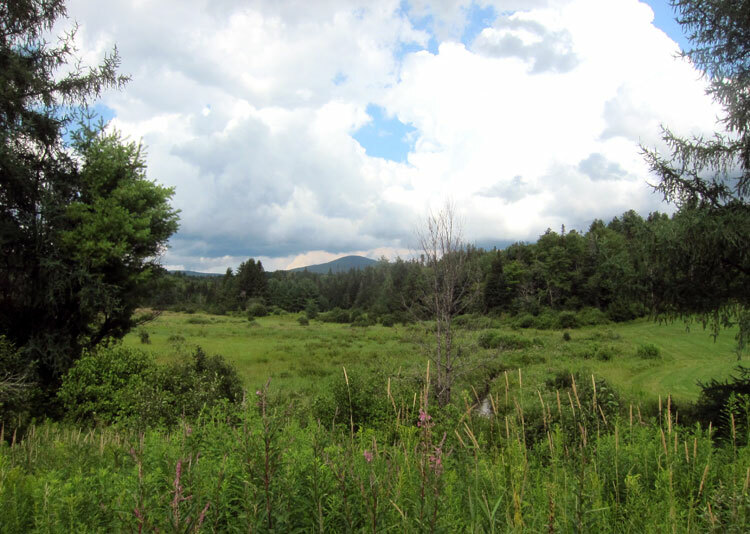 4 – Talk to a local librarian – before the tour began I chatted with the volunteer in the library to learn that in the 1920s and 30s farmers sold their land for $1 an acre to “city slickers” for summer retreats. Owned for generations, these are now retirement homes for many. 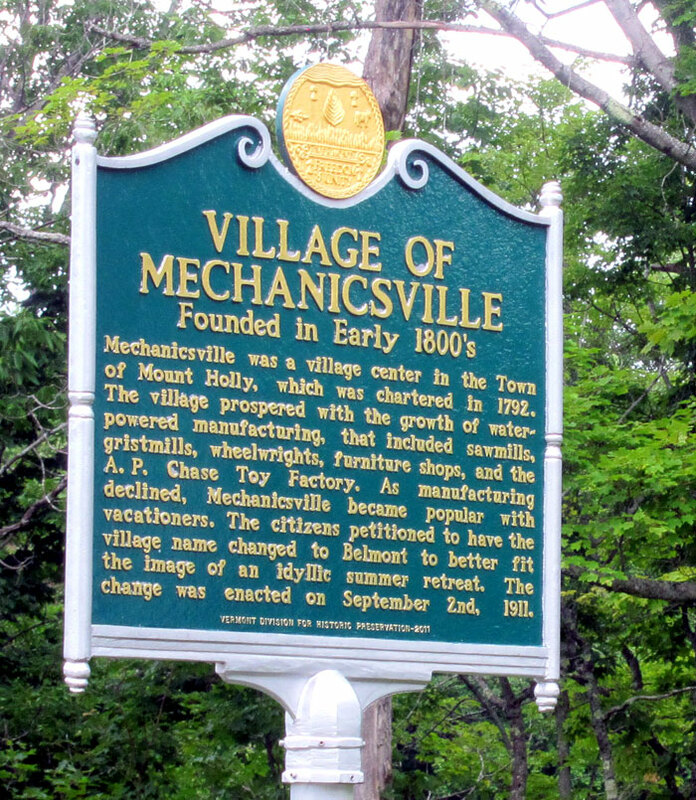 Also, as Vermont was switching to tourism, the village name of Mechanicsville was not that appealing to attract visitors to Star Lake that is right in the village. This entry was posted in Day (or maybe two) Trips and tagged Belmont General Store, Belmont Vermont, Crown Point Road, Mount Holly, VT. Bookmark the permalink. As always, an informative, interesting and a great way for us to travel with you, at least in spirit.